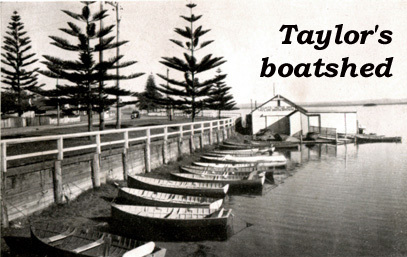 ​George Henry Edward TAYLOR was born 1840 in Punchbowl, NSW, as a second generation Australian to Edward and Jane (PEARSON) TAYLOR ​. Edward TAYLOR and his family arrived at Blue Gum Flat (Ourimbah) around 1840 and later settled at Tumbi Umbi. In 1854 Edward's wife, Jane TAYLOR, acquired all of what is now known as The Entrance. Other members of the TAYLOR family owned tracts of land in many areas of Erina Shire. In 1864, George TAYLOR married Elizabeth BRISTOWE an English girl who was governess with the KELLY family at Popran. They had 7 children. George Taylor was always happy to tell stories illustrating the hardships the early settlers endured, and always gave the highest credit to the pioneers who transformed this great district from virgin forest and scrub into a fertile productive area. George Henry Edward Taylor died at Gosford in 1935, and is buried at Wamberal Cemetery.